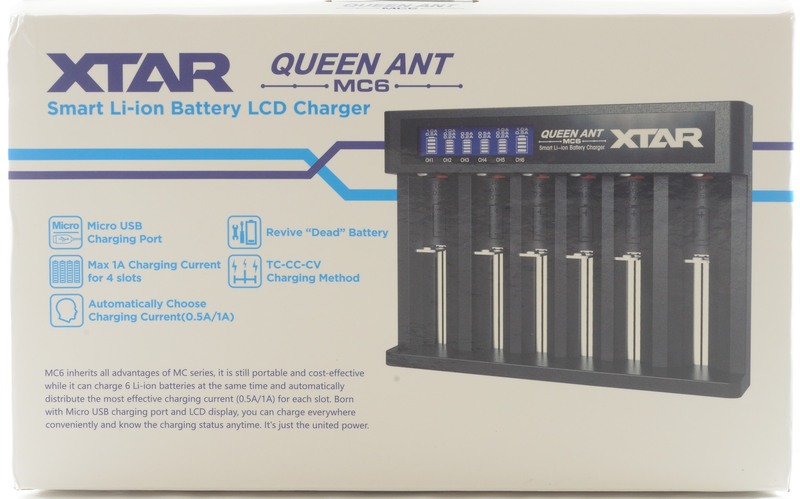 Xtar line of small chargers has got a large member, the Queen ant. 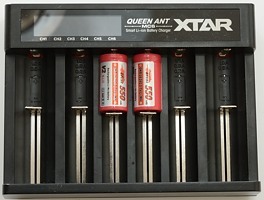 It can charge up to 6 LiIon batteries at a time and is usb powered. The box contains the charger, two usb cables, a instruction sheet, a warranty card and a welcome note. There is a good reason for two usb cables, the charger has two usb power inputs, either of them will power the charger, but only some slots will work. 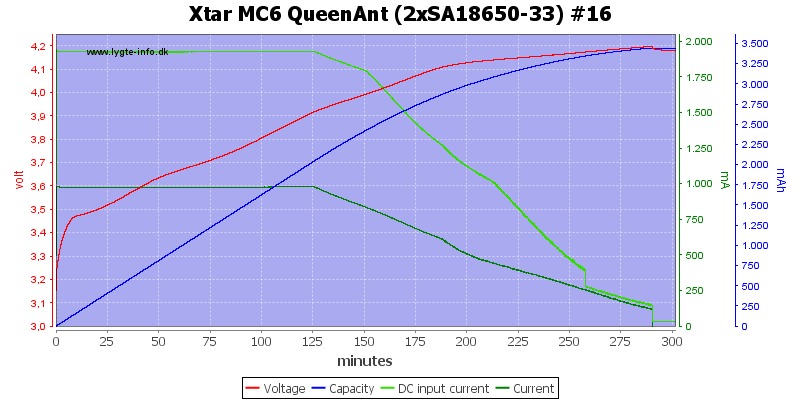 For all slots to work the charger need two 2.1A or 2.4A usb power supplies. A multi output usb charger with enough current can also be used. The charger only has a display for user interface, current selection is done with slots. Each slot has an symbols to show it is active and show current. 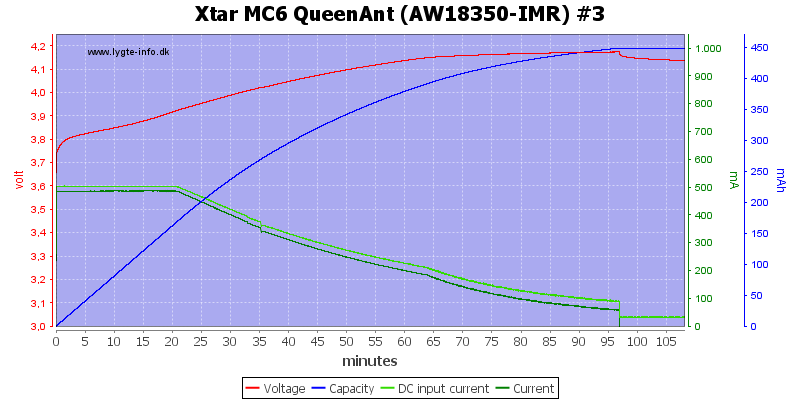 Current will vary depending on slot, number of batteries and usb power supply. 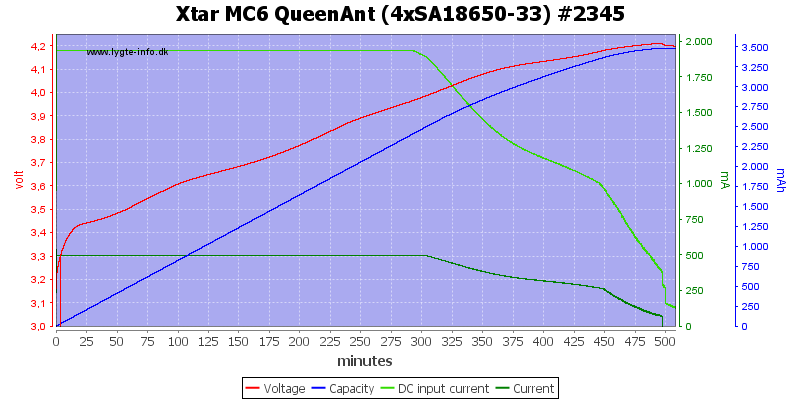 It is not possible to select 0.2A as charging current. Here the slots are charging at normal current. If one of the usb chargers/power supplies are a bit weak or the cables are long, the current may be lower this is indicated on the display. The slots uses the usual construction and works well. 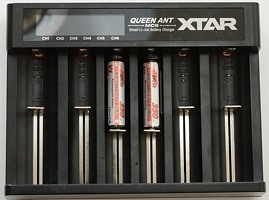 They can handle batteries from 30.5mm to 72 mm long. 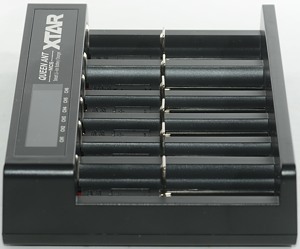 The charger can only handle two 26xxx battery at a time. 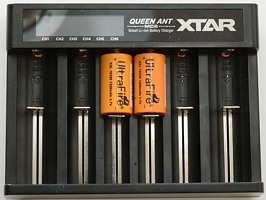 The charger can easily handle 70 mm long batteries, inclusive flat top cells. 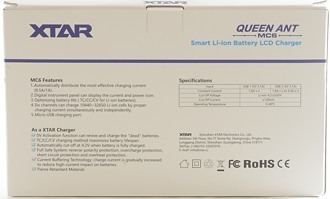 Above 2.9V it will apply regular charging. Discharges with less than 0.05mA when LiIon battery is full. Will restart if battery voltage drops below 4.06 volt. Charge will restart charging after power loss, but not on battery insertion with a nearly full battery. Slot #3 or #4 will charge with 0.5A. The total for slot #2, #3, #4 and #5 is limited to 2A, due to this slot #2 and #5 may drop to 0.5A when #3 or #4 is used. Current allocation is dynamic, i.e. 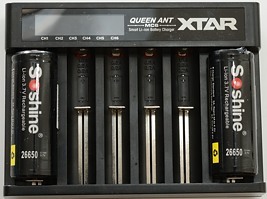 charge current can change when batteries are added, removed or full in slot #3 and #4. 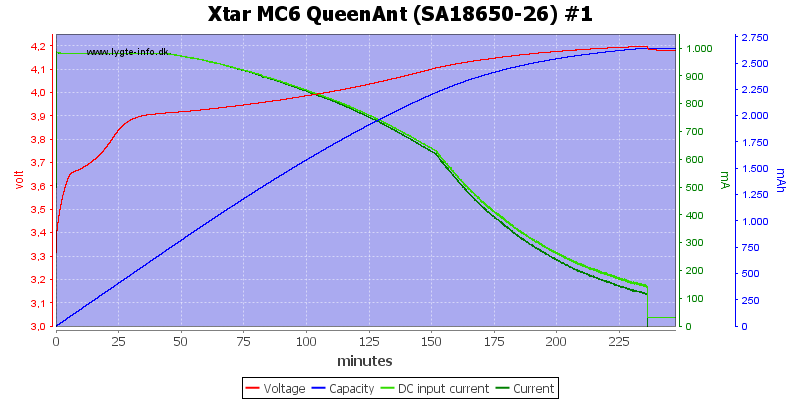 A nice CC/CV charge curve with about 120mA termination current. 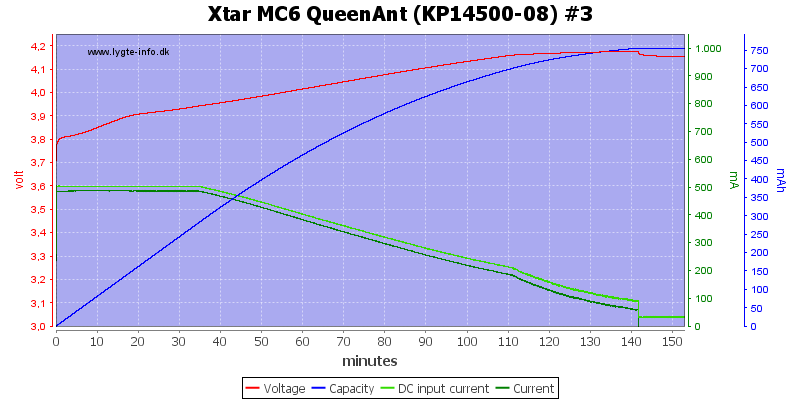 They all look similar, except #3 and #4 only chargers at 0.5A and has about 60mA termination current. 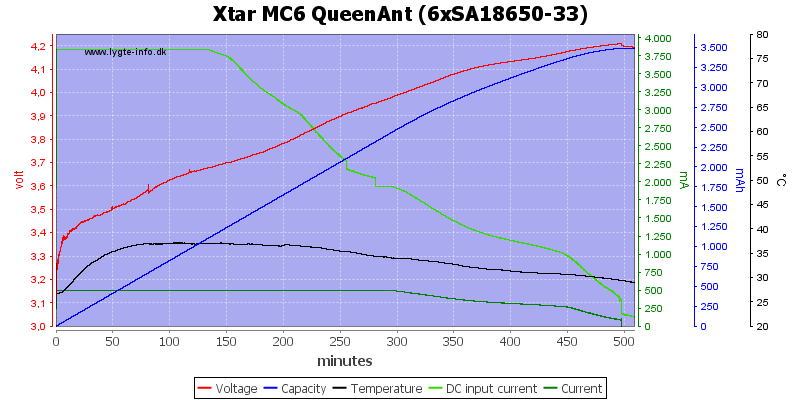 The other cell capacities looks fine. I charged the two small cells in slot #3 to get the lower charge current, this works fine. Charging slot #1 and #6 with one usb power supply connected. 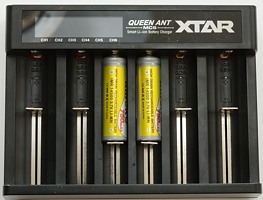 Charging slot #2, #3, #4 and #5 with one usb power supply connected. 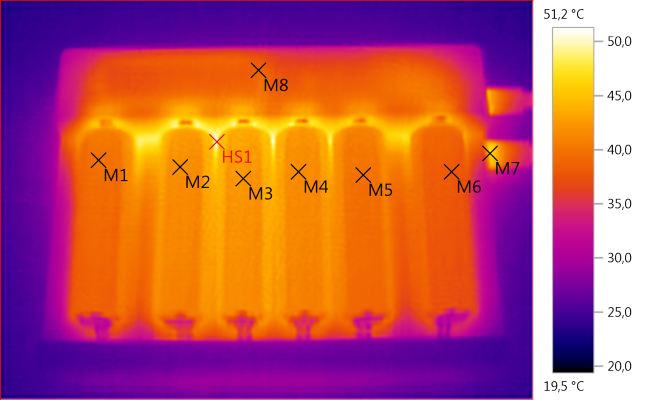 Charging all slots with two usb power connected, I measured on slot #3. 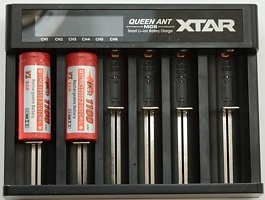 Adding a 0.5ohm resistor in series with the power supplies forces the charger to reduce charge current, this means longer charge time and the batteries are charged fine. 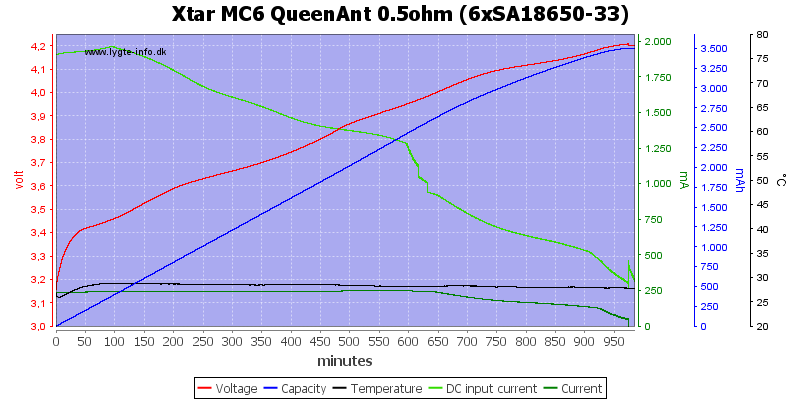 With all channels at full power the charger get a bit warm, but nothing problematic. 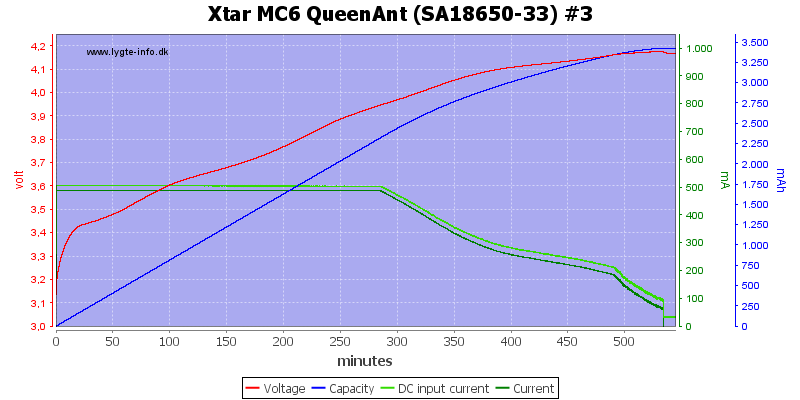 Here the two 1A charges are finished and only the four 0.5A is running, this means considerable less heat. 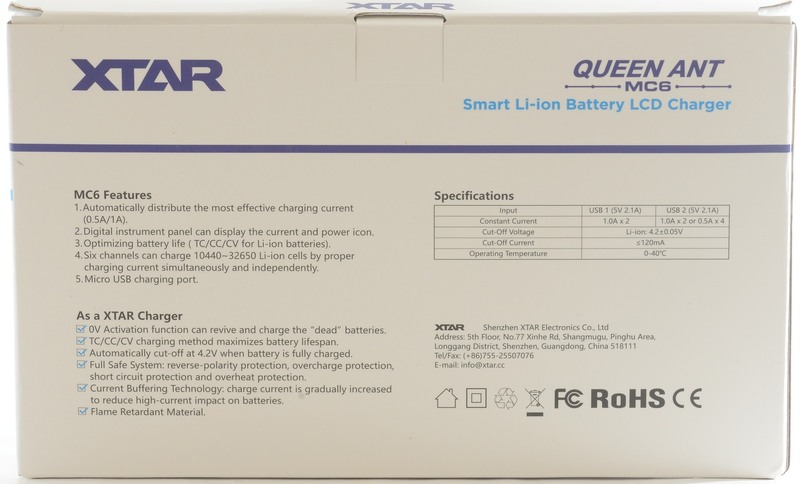 The charge will start with lowest charge current when power is applied, after two seconds it will increase to full charge current. 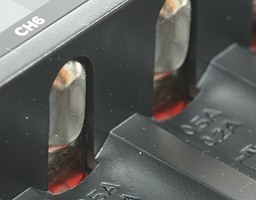 On the second channel it steps 0.2A, 0.5A and 1A. 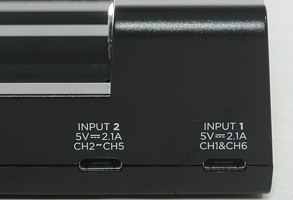 The usb power to this charger is a bit special with two inputs, using advanced USC-C would have limited to one connector, but also limited the number of available usb chargers. 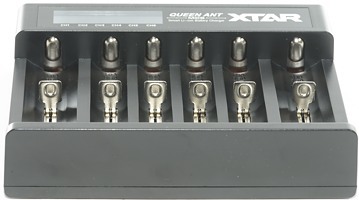 At the current time the solution with two connectors is probably the best. 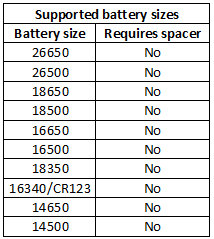 The lack of current selection means that the charger is not very good for 10440 cells (The 0.2A setting do not really exist), but can handle anything larger. 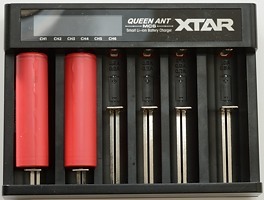 The charger can handle up to four cells at 1A and two cells at 0.5A. 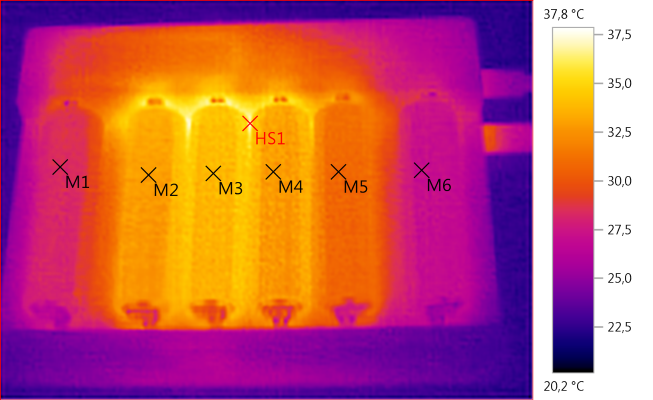 Slot #2 and #5 is not really good for 0.5A charging, because they can change to 1A at any time (Not very smart if they are used for small cells). 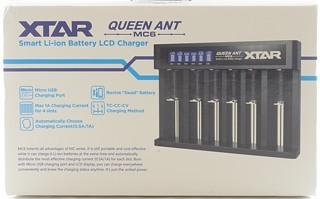 The charger is good at charging and works fine for people with many LiIon that need 1A charging, but the current selection could have been better. 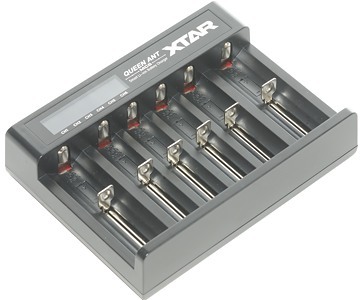 The charger was supplied by a Xtar for review.